Haredi soldiers honored at award ceremony as the battalion continues to neutralize terror attacks. 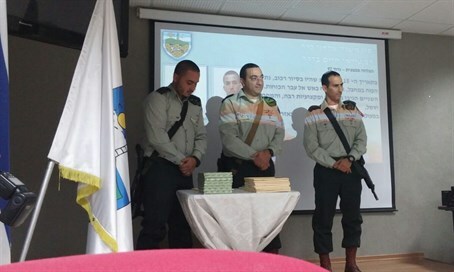 A ceremony honoring the Netzach Yehuda battalion was held last week at the headquarters of the Binyamin Regional Brigade. Soldiers of the battalion, who in the past few weeks neutralized several terror attacks in the area, were awarded certificates of merit during a ceremony which was attended by regiment commanders and the soldiers' families. Col. Israel Shomer, commander of the Binyamin regional regiment, congratulated the troops for their bravery and praised their families for raising courageous children. Amongst the terror attacks that were neutralized, were car-ramming attacks at the check-point near the town of Ofra in Samaria, and an attack in Jerusalem’s Romema neighborhood which was eliminated by a soldier of the battalion, in an action which later awarded him with a certificate of appreciation from the Chief of the Jerusalem district police. Moreover, the battalion received praises in an internal report conducted by the Kfir Brigade, and the brigade commander, Col. Guy Hazut. According to various operational measurements, the Netzach Yehuda battalion received the highest scores and was chosen as the most outstanding battalion for the month of January. The awards of excellence join the battalion's collection of previously honors received in the last several years. The battalion has also received the “Chief of Staff Award”, the “Head of Technology and Logistics Award”, the “Ground Forces Command Award” and the “Headquarters Officer of Paratroopers and Infantry Award." Last year, the Battalion's reserves unit received the “President's Award." "The battalion's soldiers' courage and hard work are demonstrated in each sector the battalion is stationed at," said Nahal Haredi Foundation Co-Founder and President Rabbi Tzvi Klebanow. "With the help of Heaven, soldiers of the battalion are working day and night to maintain the civilian daily life in the sector and I'm glad to see that their hard work is also demonstrated by their success in achieving great accomplishments, receiving praises from the heads of the brigade," said Rabbi Klebanow. "We will continue to stand firm in the face of the threats opposing us, while maintaining that path and values of the Torah, which the soldiers keep at all times."